Let me begin by saying that we always choose Norwegian for our cruising. By now, we&apos;ve been to nearly every Caribbean island. We&apos;ve cruised the North Sea, we&apos;ve cruised the Baltic. It was time to visit Australia and the last Asian country we have yet to visit, Indonesia. Besides, sick of snow and freezing temperatures, it was a great time to chase the summer heat. One thing we really didn&apos;t consider too much, was that if you want to get to know a bit about Australia or Indonesia, for that matter, you&apos;re not likely to do it on a cruise. 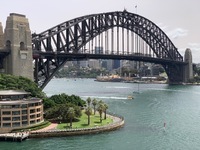 If you take an excursion at every Australian port, for instance, you will have spent a total of ten or twelve hours in Australia. It took us twice that long just to fly there! On the other hand, if you&apos;re looking to put a pin in that map on the wall in two more countries and escape the winter doldrums, then this may be the cruise for you. So, having said that, the weather was great for the most part, more hot and humid as we headed north towards the equator, but that was expected. The excursions were all good, but nothing spectacular. There were a few tender ports of call and I did hear a lot of people who left the ship on their own or who&apos;d booked private excursions (not with Norwegian) complain about long lines and waiting times. But if you had purchased an excursions though NCL, there were no problems, just the typical crowding in the Stardust Theatre with everybody sitting in an end seat trying to be first off. It seemed to me that the rest of the passengers on the ship were a mostly older, sedate crowd with very few visible children which is always nice. The breakfast buffet would be crowded in the mornings with more people than seats, but what was nice was that they&apos;d allow you to bring your food in to La Cucina. Wow! what a difference to sit at a nice table with not too many people and no loud-talkers! Only about thirty steps outside the Garden Cafe I can&apos;t imagine why so few people would take the short journey. We had every breakfast there and dinners were either in one of the two main dining rooms or at a pay restaurant (we had seven meals coming to us), so not one dinner in the buffet. All things considered, it wasn&apos;t a bad cruise and our longest one to date. Still, the nineteen nights went fast. Would I do it again? Sure, but this time we&apos;re looking at Sydney to New Zealand. And one thing I would do differently: I would definitely arrive a few days before the cruise instead of three hours before the cruise! Sydney looks like a beautiful city and next time I would like to actually see it! And one last thing: no matter the cruise, the people who work for NCL are truly incredible. Imagine leaving your family for ten months at a time (I know...some of you may enjoy that), working long hard hours for probably not a lot of money, living three or four to a small inside cabin and still smile at us all the time and say hello and ask how our day is going? Can you imagine? We have met some nice, down to earth people on our cruises and always treat them with dignity and respect. I hope everyone else does, too. Let me begin by saying that we always choose Norwegian for our cruising. By now, we&apos;ve been to nearly every Caribbean island. We&apos;ve cruised the North Sea, we&apos;ve cruised the Baltic. It was time to visit Australia and the last Asian country we have yet to visit, Indonesia. Besides, sick of snow and freezing temperatures, it was a great time to chase the summer heat. One thing we really didn&apos;t consider too much, was that if you want to get to know a bit about Australia or Indonesia, for that matter, you&apos;re not likely to do it on a cruise. If you take an excursion at every Australian port, for instance, you will have spent a total of ten or twelve hours in Australia. It took us twice that long just to fly there! On the other hand, if you&apos;re looking to put a pin in that map on the wall in two more countries and escape the winter doldrums, then this may be the cruise for you. So, having said that, the weather was great for the most part, more hot and humid as we headed north towards the equator, but that was expected. The excursions were all good, but nothing spectacular. There were a few tender ports of call and I did hear a lot of people who left the ship on their own or who&apos;d booked private excursions (not with Norwegian) complain about long lines and waiting times. But if you had purchased an excursions though NCL, there were no problems, just the typical crowding in the Stardust Theatre with everybody sitting in an end seat trying to be first off. It seemed to me that the rest of the passengers on the ship were a mostly older, sedate crowd with very few visible children which is always nice. The breakfast buffet would be crowded in the mornings with more people than seats, but what was nice was that they&apos;d allow you to bring your food in to La Cucina. Wow! what a difference to sit at a nice table with not too many people and no loud-talkers! Only about thirty steps outside the Garden Cafe I can&apos;t imagine why so few people would take the short journey. We had every breakfast there and dinners were either in one of the two main dining rooms or at a pay restaurant (we had seven meals coming to us), so not one dinner in the buffet. All things considered, it wasn&apos;t a bad cruise and our longest one to date. Still, the nineteen nights went fast. Would I do it again? Sure, but this time we&apos;re looking at Sydney to New Zealand. And one thing I would do differently: I would definitely arrive a few days before the cruise instead of three hours before the cruise! Sydney looks like a beautiful city and next time I would like to actually see it! 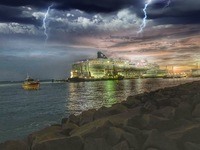 And one last thing: no matter the cruise, the people who work for NCL are truly incredible. Imagine leaving your family for ten months at a time (I know...some of you may enjoy that), working long hard hours for probably not a lot of money, living three or four to a small inside cabin and still smile at us all the time and say hello and ask how our day is going? Can you imagine? We have met some nice, down to earth people on our cruises and always treat them with dignity and respect. I hope everyone else does, too. You know, I walked into this mid-ship balcony room and immediately saw that the desk by the balcony door was missing. Upon closer inspection, I saw that the picture that should be on the wall over the couch was missing. All that remained were three picture hooks still in place. Well, I didn&apos;t want to be accused of stealing the picture or anything, so I casually mentioned it to our room steward. Her answer was "dry dock." Now I can&apos;t for the life of me figure why they&apos;d remove a desk and picture in dry dock and not replace it with another desk and picture. Isn&apos;t dry dock where they change the oil and scrape the barnacles off the ship anyway? So our room looked and felt more like a three hour hotel room than proper accommodation for a nineteen day cruise, but we&apos;ll just basically sleeping here, anyway. Right? Well, after two nights on that ultra soft bed, my back was killing me. So, I decided to try to unfold the couch and give my back a night on the much harder surface. This extra bed must be where the extra person sleeps... Norwegian has some kind of friend and family benefit were you can bring along someone for no extra charge. Sounds great...but does anyone really want to cruise and bring along a friend? Or family, for that matter? Well, as long as the person is less than four feet tall, I guess it&apos;s OK. I&apos;m six feet and my feet clearly hung off of that bed! I had to support them with the little stool that comes with the room. My back gradually felt better, but it had all the feel of a prison bed! Another problem in the cabin was that the sliding door to the balcony would not fully engage the lock. I didn&apos;t think Spider Man would try to get into the room, so it wasn&apos;t a big deal, so I didn&apos;t mention it at the time. The safe wasn&apos;t user friendly, either. The keypad numbers had to be pressed about a dozen times in order for the digital number to show up. This meant that in order to put your four digit code in, you sometimes had to press the numbers forty to fifty times in order to open the safe! I gave up on Day 1 and we did not use the safe at all. 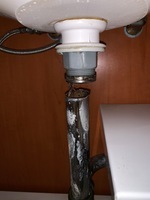 Another issue we found on Day 1 was that the shower water was not going down the drain as fast as it ought to. If fact, if you stood in there for more than five minutes, it appeared as if the water would breach the barrier and flow onto the floor of the bathroom. We brought this one to the attention of the room steward and she assured us that it would be taken care of. I don&apos;t know when or if they came, but the drain flow did seem to improve, although only slightly. We decided to tough this one out and never mentioned it again. Then there was the funky smell that seemed to emanate from the bathroom and into the cabin itself. No, it didn&apos;t appear to be human waste, but it definitely did have a heavy musty smell, similar to a long dead mouse caught behind a wall. We were assured that it had something to do with the drain and that it would be taken care of. In a few days, the odor was gone. Now, here comes the straw that broke the camel&apos;s back: About ten days into the cruise, we noticed a great deal of water on the floor in front of the sink. I got down and took a look. To my amazement, the pipe that leads from the drain in the sink, was completely disconnected from the sink. Yes, that&apos;s what I said: Completely disconnected. Both on the pipe and where it had been connected to the sink, you could see a lot of solder, so this had obviously been a problem in the past. Maybe even more than once. We got the steward and told her, but this time we went down to the front desk on the 7th floor in the atrium. I calmly and politely voiced my dissatisfaction and we returned to the room. Seconds later, a plumber appeared and a guy to repair the sliding door accompanied by a uniformed officer. No, it wasn&apos;t the captain, but rather a supervisor in the maintenance department. I calmly informed her of the laundry list of problems with the room and she yes-sired me to death. I did tell her that we have come to know and love Norwegian and as platinum members have sailed more than a few times. But honestly, if this had been my first time with Norwegian, it definitely would have been my last. So how did they rectify this problem? How did they make it right? Extra points? A spa treatment? Dinner for two at Cagney&apos;s? No, instead they sent us a plate with a half dozen different chocolates and a cheap bottle of wine. Anyhow, that&apos;s the room story. One other thing: The location of the room is right by the opening to the 10th floor midship lobby, stairway and elevators. I was concerned that there might be a lot of noise in this room, but that was not true at all. For the first few days, though, we were woken up at 2:00am to what appeared to be a neighbor using the hairdryer! To my amazement, though, it was a worker vacuuming the 10th floor lobby in front of the elevators. This one we mentioned to the room steward and it was never an issue again. I&apos;m glad I visited Bali this way rather than spending thousands of dollars to visit independently! I pictured Bali as a pristine magical place, but found it to be quite dirty. I noticed litter everywhere and disorder in the cities outside of the tourist area. All the homes appeared to be in various states of construction. The temple/ park they took us to took about two or three hours to drive to. A lot of traffic along the way, crazy drivers, too. Another tender port where I heard people complaining about long lines to tender back to the ship. OK tour, but definitely not great. Good guide, though...her name escapes me, but she was very enthusiastic and informative. It is what it is. Koalas sleep for twenty-two hours a day! So, most koalas were dozing. They were in enclosures that didn&apos;t look natural, so in other words any pictures would have unavoidable man-made objects in them. There was a field full of kangaroos, but the humans were always following them about or even physically repositioning them for purposes of the photo! A lot of pushing and jostling for position made you wonder who were the animals! Forget about actually holding a koala...the line was very long and a worker would hold one as you stood by. Seemed like a big rip-off! It was OK, but nothing to write home about. Nice city...extremely hot! The driver/ tour guide was great, but we found ourselves in the midst of a driving tropical monsoon that kept us from visiting two places!